Obituary – Griego, Margaret Bernadine (Bunner) « Perry High School Alumni Association, Inc.
– 18 year old daughter of Maggie Maloch, was born at Norman, and attended school at Blackwell, Davenport and Maramac before coming to Perry. She received her first and last years of primary and Secondary education here. 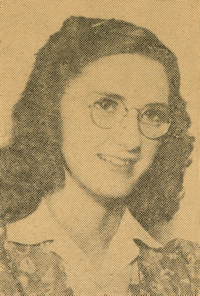 Margaret was a member of the student council for three years and also belongs to the Red Hots pep club. She participated in glee club and operetta during her freshman and sophomore years. She devotes her spare time to reading, swimming, and collecting cartoons. She plans to attend college next year, but is undecided as to what school she will attend. Margaret B. West Griego, 83, of Montclair, California passed away on March 5, 2006 after a brief illness. Born April 6, 1922 in Norman, Oklahoma, she was a resident of Montclair, California for 42 years. Margaret worked as a Psychiatric Technician at Laterman State Hospital for 25 years. She retired in 1985. She had been a Sunday school teacher and a Blue Bird leader. She belonged to the Fun-After-Fifty Club, and was secretary of her bowling league for a number of years. 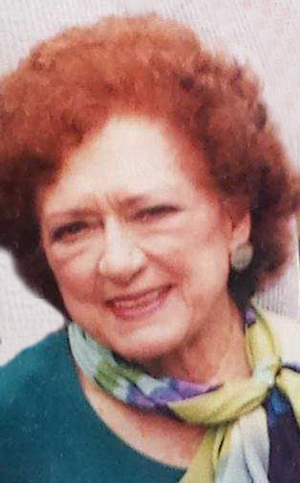 She enjoyed her many friends and family and was adored by her grandchildren. She is survived by her husband Roger C. Griego; her three daughters Charlcie M. Gill of Astoria, Oregon, Vicki L. Cox of Cheyenne, Wyoming, and Margie M. Maher of Pinon Hills, California; her two sons Robert E. West of Renton, Washington, and Dr. Edward L. West of Anderson Island, Washington; her brother John Bunner of Fort Bragg, California; sixteen grandchildren and twenty-three great-grandchildren, as well as her best friends Kate Carroll and Sharla Gooch. Visitation is to be held on Wednesday the 8th day of March 2006 from 5:00-8:00 p.m. at Stone Funeral Home, 355 E. 9th St. Upland, Ca. Services will be held on Thursday, the 9th of March 2006 at 11:00 a.m. at Stone Funeral Home. Margaret will be laid to rest at Riverside National Cemetery. Stone Funeral Home, Upland is in charge of arrangements.